As Charlotte's mobility increases, those things that she is and is not interested in become more apparent. Currently a few of her favorite things are electrical cords, paper, and plastic bags. This is very reminiscent of Amelia's likes and dislikes at this same age. Why is it that the baskets and bins full of toys hold no interest, while those things which can cause the most harm are intensely attractive? I believe surviving infancy is truly a feat. More specifically, I feel that me surviving my daughters infancy warrants congratulations. The fun goes on. On a completely unrelated note, today we attended the christening of Erik's nephew Anderson. Before the service began I took Amelia to use the bathroom. We walked into the stall and I turned around to latch the door. 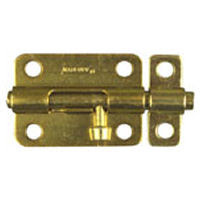 The latch looked something like this, except that there was a hole in the door for the bolt to slide into. The hole and the bolt and hole were not lined up very well, and I worked and worked trying to make the door latch. I even tried lifting the door in attempts to get the door to latch. I was getting somewhat frustrated when I glanced up a few inches and saw there was another option. The hook slipped into the eye without a problem except for the feeling of foolishness that lingeres with me. I could take our entire family out for filet minion dinners if I had a dollar for every time I have been in that same "oh wait, here's the real lock' situation. We can't wait to see you all this weekend.